Snake using his back aerial to stage spike Lucas in Brawl. Marth punishing Zero Suit Samus's meteor cancel after a footstool spike by using Dolphin Slash to stage spike her. 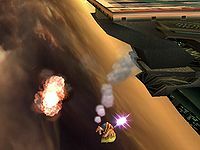 A stage spike (officially known as an edge meteor) is what occurs when a fighter is knocked against part of the stage, which causes them to bounce downward in a similar fashion to a meteor smash. Stage spikes can be used as an edge-guarding or as a edge-guard breaking technique, depending on who is doing the stage spike. One example is Marth using his Dolphin Slash below the stage to knock a recovering opponent into the stage, knocking them out. Unlike meteors, stage spikes can easily occur by accident. Stage spikes are most useful for characters who have difficulty KOing opponents otherwise (such as Sonic), though they are incredibly useful for any character as they provide the means for an especially early KO. Stage spikes usually occur when an opponent is recovering from below near the stage, where the edge-guarder can then drop off and hit the opponent with an aerial, knocking them into the stage and stage spiking as a result. Stage spikes also commonly occur to reckless edge-guarders, who get hit into the stage and stage spiked from the opponent's recovery move; this especially happens when a player attempts to edgehog too soon and runs out of their ledge invincibility before the opponent's recovery move hits them. The risk of getting stage spiked can serve as a significant deterrent to edge-guarding characters whose recovery moves deal high knockback, such as the aforementioned Marth and Meta Knight. There are no flaws with stage spiking in the original Super Smash Bros., but the addition of teching on walls and ceilings in Melee allows stage-spiked characters to completely nullify the knockback; as teching can be buffered in Melee by pressing the button before even taking the hit, this can be done with relative ease if the victim predicts it. Brawl disables the ability to buffer techs in this way, which makes the timing more strict and makes stage spikes overall more effective. Lucas' PK Thunder self-stage spike. Self-stage spiking involves a failed recovery move. Self-stage spiking occurs when the player tries to recover, but instead, in addition to missing the ledge, ends up hitting part of the stage, bouncing off, and then falling down as if they were spiked. Ness and Lucas, as part of their PK Thunder attacks, are particularly prone to self-stage spiking. Fox, Falco, Diddy Kong, and Lucario are also prone to self-stage spiking, albeit to a lesser extent, due to them having more control over which direction their recoveries travel in. Meteor smash - an attack that deals downward knockback but can be recovered from through meteor cancelling in Melee and Brawl. Semi-spike - an attack that hits the opponent at a low horizontal angle that hinders recovery opportunities. This page was last edited on February 14, 2019, at 19:54.